Television has finally grown up and is beginning to pay for its long and expensive childhood. “THOMAS R. JOHNSON’S account, please,” the busy teller says into the phone. Back in the bank’s file room the depositor’s account sheet is placed on an easel before a fixed-focus television camera and the image of the ledger balance and Johnson’s signature flashes onto a television screen in the cashier’s cage. With the balance thus checked and the signature verified quickly, the depositor’s needs are served with dispatch, without the teller having to leave his post. Hypothetical cases all, yet they far from tax the capacity of television to serve as an industrial medium. 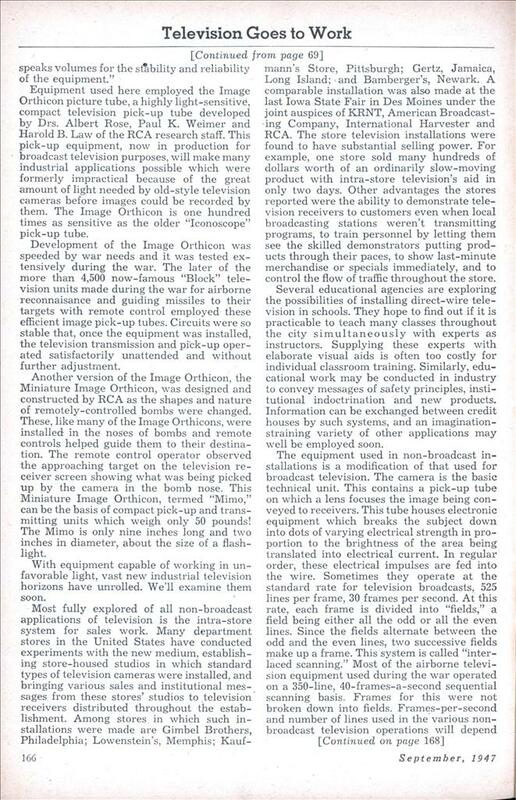 The vast publicity broadcast television for the home has received in the past and the channeling of early postwar production to fill backlogs of orders for broadcast service have overshadowed the important fields of non-broadcast television for the moment. But industrial television sales have begun and may soon rival those for commercial television stations. As far as equipment is concerned, non-broadcast television has much in common with the other service. Both have as their function the translating of images into series of electrical impulses which, at some distance, are retranslated into visual impressions on the face of a cathode-ray television receiver screen. The principal difference between them is that while one is sent through the ether to receivers in homes scattered throughout the broadcast range of the station, the other moves its picture-creating electrical impulses directly by special wires from the camera through the necessary controls to the receiver. Sound is mandatory for broadcasts, optional for industrial television. An FCC license is required for the former but not necessarily for the latter. Non-broadcast television viewing monitors are far simpler in design and construction than are television home receivers. And, while broadcast television equipment is of standard, stock designs for the most part, the special television equipment for industrial installations may have to be tailored in de- sign to the particular industry’s needs. From the early exploratory thinking of leading manufacturers, we can shape the general pattern of this younger brother of commercial broadcast televisions. Envision the uses of visual intercommunication: The advertising executive can make decisions about layouts, typefaces or illustrations without leaving his desk. Schematic drawings and blueprints may be televised from a central drawing room so that copies can be checked against master drawings or file records without danger of loss or alteration of valuable graphic matter. The stockroom can show supplies to engineers to check shapes and models of components. Newspapermen can check the clippings’ “morgue” for research material. Police can flash pictures of wanted persons to outlying stations. Especially useful applications of this phase of industrial television are where plants of one company are distributed throughout the city or related activities are scattered among several floors. Efficiency, too, can be heightened by industrial television. Picture the ease with which a time and motion study expert can analyze the comparative production of two workers with a known efficiency ratio when working on tables of different colors or heights or under different types of lighting. Their every move can be shown by the television cameras wired to screens set side by side. Television can let management inspect and control operations from a central point. One man, for example, equipped with television and a communications system, could supervise the loading of several boats at once. Safety tests, inspection of work in remote departments—all sorts of possibilities are presented by this service, heightening the efficiency of executives and improving the organization of operations. Television cameras could even be placed strategically around cross-country and race courses to watch where the judges, unaided, could not! Probably the most valued of the industrial television functions will be of a safety nature. Wherever there’s danger or discomfort for the observer, his place may be taken by a television camera and his observations made from a safe distance away. Television cameras could watch the cells of prison inmates or those of mental asylums. Banks might use industrial television as a protective device so that the cameras are trained on the entire floor or on areas before the cages and watchers stationed before receivers in remote parts of the bank may recognize participants in hold-ups and record activities on movie film used to photograph the face of the viewing screen. Watching the processes in melting vats and furnaces, noting product flow in a room filled with gas or poisonous fumes, studying what goes on amid smoke or extreme heat or cold, the television cameras can protect workers in many phases of technology. During the war, RCA Victor supplied the Manhattan Project with several industrial television units for use in observing processes involved in the manufacture of atomic bombs. Frequently the camera can go where man cannot. It can be lowered in a spiral course down an oil or water well to inspect the casing with the aid of an attached light. It can be inserted in the tip of a plane wing to examine remote or inaccessible crannies. Explorations of sewage and aqueduct pipe lines may be conducted with television’s probing eye. Where the water is not too densely cluttered with algae or silt, television can make preliminary investigations before divers go down in salvage operations. Rescue work in gas or smoke may be facilitated by a wide-angle-lensed camera propelled ahead of rescuers. Science has already learned to use television for its exploratory purposes. Television cameras and receivers plumbed mysteries of atomic energy at Bikini Atoll that could not have been approached by any other knowledge-attaining facilities. Further studies of explosives or such natural geological phenomena as geysers or volcanoes may well be on television’s future docket. Some indication of the powers of this equipment may be obtained from the statement issued by Arthur F. Van Dyck, official observer for the Radio Corporation of America at the Bikini bomb tests: “The tests involved a situation to which television was ideally suited. To give valuable assistance, it was highly desirable to have a close view of what happened in the target area while it was happening, but no human eye could be closer than eight or ten miles with safety, and photographic cameras could show nothing until their films were developed. The television camera could be close to the scene however, and two RCA cameras were installed on Bikini Island about half a mile apart and about three miles from the explosion point. Therefore, they picked up and broadcast the views that human eyes would have seen had they been on Bikini. Equipment used here employed the Image Orthicon picture tube, a highly light-sensitive, compact television pick-up tube developed by Drs. 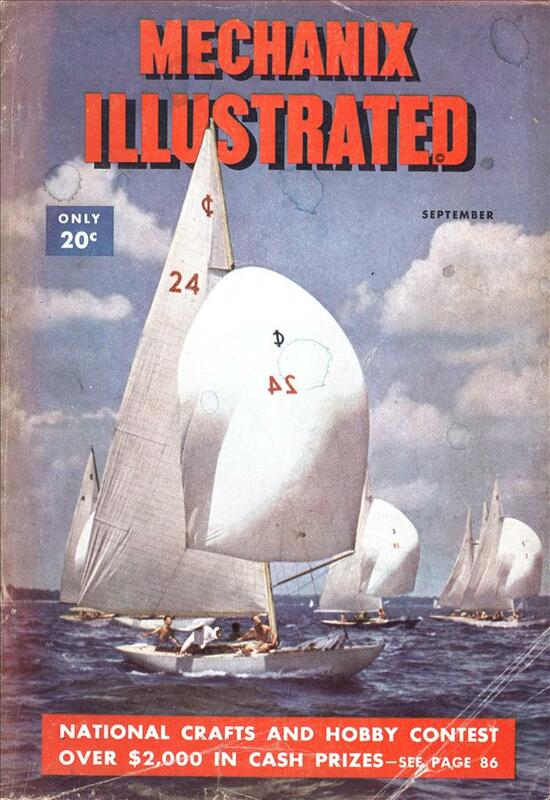 Albert Rose, Paul K. Weimer and Harold B. Law of the RCA research staff. This pick-up equipment, now in production for broadcast television purposes, will make many industrial applications possible which were formerly impractical because of the great amount of light needed by old-style television cameras before images could be recorded by them. The Image Orthicon is one hundred times as sensitive as the older “Iconoscope” pick-up tube. Development of the Image Orthicon was speeded by war needs and it was tested extensively during the war. The later of the more than 4,500 now-famous “Block” television units made during the war for airborne reconnaisance and guiding missiles to their targets with remote control employed these efficient image pick-up tubes. Circuits were so stable that, once the equipment was installed, the television transmission and pick-up operated satisfactorily unattended and without further adjustment. Another version of the Image Orthicon, the Miniature Image Orthicon, was designed and constructed by RCA as the shapes and nature of remotely-controlled bombs were changed. These, like many of the Image Orthicons, were installed in the noses of bombs and remote controls helped guide them to their destination. The remote control operator observed the approaching target on the television receiver screen showing what was being picked up by the camera in the bomb nose. This Miniature Image Orthicon, termed “Mimo,” can be the basis of compact pick-up and transmitting units which weigh only 50 pounds! The Mimo is only nine inches long and two inches in diameter, about the size of a flashlight. With equipment capable of working in unfavorable light, vast new industrial television horizons have unrolled. We’ll examine them soon. Most fully explored of all non-broadcast applications of television is the intra-store system for sales work. Many department stores in the United States have conducted experiments with the new medium, establishing store-housed studios in which standard types of television cameras were installed, and bringing various sales and institutional messages from these stores’ studios to television receivers distributed throughout the establishment. Among stores in which such installations were made are Gimbel Brothers, Philadelphia; Lowenstein’s, Memphis; Kaufmann’s Store, Pittsburgh; Gertz, Jamaica, Long Island; and Bamberger’s, Newark. A comparable installation was also made at the last Iowa State Fair in Des Moines under the joint auspices of KRNT, American Broadcasting Company, International Harvester and RCA. The store television installations were found to have substantial selling power. For example, one store sold many hundreds of dollars worth of an ordinarily slow-moving product with intra-store television’s aid in only two days. Other advantages the stores reported were the ability to demonstrate television receivers to customers even when local broadcasting stations weren’t transmitting programs, to train personnel by letting them see the skilled demonstrators putting products through their paces, to show last-minute merchandise or specials immediately, and to control the flow of traffic throughout the store. Several educational agencies are exploring the possibilities of installing direct-wire television in schools. They hope to find out if it is practicable to teach many classes throughout the city simultaneously with experts as instructors. Supplying these experts with elaborate visual aids is often too costly for individual classroom training. Similarly, educational work may be conducted in industry to convey messages of safety principles, institutional indoctrination and new products. Information can be exchanged between credit houses by such systems, and an imagination-straining variety of other applications may well be employed soon. The equipment used in non-broadcast installations is a modification of that used for broadcast television. The camera is the basic technical unit. This contains a pick-up tube on which a lens focuses the image being conveyed to receivers. This tube houses electronic equipment which breaks the subject down into dots of varying electrical strength in proportion to the brightness of the area being translated into electrical current. In regular order, these electrical impulses are fed into the wire. Sometimes they operate at the standard rate for television broadcasts, 525 lines per frame, 30 frames per second. At this rate, each frame is divided into “fields,” a field being either all the odd or all the even lines. Since the fields alternate between the odd and the even lines, two successive fields make up a frame. This system is called “interlaced scanning.” Most of the airborne television equipment used during the war operated on a 350-line, 40-frames-a-second sequential scanning basis. Frames for this were not broken down into fields. Frames-per-second and number of lines used in the various non-broadcast television operations will depend on the requirements of the individual applications. A pre-amplifier network is used in the camera or in conjunction with it. Many tubes used in this system were developed during the war, permitting more stable operation and greater compactness than before. This circuit strengthens the tiny electrical impulses enough so that they can travel from the camera to the camera controls or the receiver. The signal level is raised in this pre-amplifier circuit by whatever degree is necessary for the particular installation, usually to about six milliwatts. A horizontal sweep amplifier is also housed in the camera to transmit the horizontal sweep signals of the synchronizing generator. This determines the order in which the electron beam in the camera picks up the tiny dots into which the televised image is divided for transmission. Viewfinders are necessary when the subject covered by the camera is being changed rapidly as, for example, in department store installations. For many industrial television installations, though, the area covered as well as the focusing may be rigidly pre-set at the time of the installation and they needn’t be disturbed thereafter save for check-ups. This applies particularly where the Image Orthicon’s lens is stopped down considerably, affording a generous depth of focus. Those cameras which are to be mobile may be mounted on free-rolling dollies, either of the floor model type or with a boom for elevating the camera to high angles for special perspectives. In the case of most industrial installations, however, special camera jigs or mounts will be devised for stability, compactness and to carry the camera to the position required for the application or to hold it there. Where the picture will be changing rapidly, such as when the dolly-mounted camera will be in frequent motion or where several cameras are observing the subject from different positions, the installation will probably require a control console. Here are retained all electrical controls of the cameras, as well as monitor tubes on which control personnel can see what images the cameras are picking up before the pictures are sent on to the receivers. The pictures may be dimmed or brightened at this point, either in given areas or over-all. Keystoning (proper proportioning of the televised image frame), horizontal and vertical sweep, and beam strength and meters are also controlled at this console, as are the electrical strength of the picture and light volume and contrast. In some industrial installations, this control console will not prove necessary and a “jeep” installation can be made. In the latter, most of the functions of the control console, in- cluding the output gain which re-strengthens the signal so that it can go onto the lines without noticeable loss, are handled by a control box with most controls pre-set. For “jeep” installations, the images travel more directly from camera to receiver and the necessary operations of the control console are either built into the control box or into a more elaborate camera housing. Where there’s inter-wiring between several cameras and one or several receivers, it’s possible to install a switching unit so that images being picked up by any one of the cameras may be shown on the receivers. With a more complicated plan of installation, you can even superimpose two or more pictures on one screen, should the nature of the application make it desirable. Equipment for non-broadcast television, while costly, is substantially less so than that for broadcast purposes, generally. No antenna is required. No r.f. pick-up is needed. The transmission system is far simpler than that used for broadcasts. And cabinet costs are avoided by use of industrial-type reception monitors for receivers. Where the installations are comparatively elaborate and comparable to broadcasting facilities, secondary benefits may be derived. These facilities, closely paralleling those of small television stations, may permit programs to be picked up in the store studio and sent by wire or relay to a nearby station during part of the day for actual television broadcasts. Industrial television is only now beginning to be appraised and explored. That its future roles in safety, efficiency, employment, technological advancement and the new realms of communications will prove crucial is already apparent. Already the young art of television holds promise of conquering many a valuable new world.